Two rockets fired from YPG-held Afrin in Syria struck the Turkish border town of Kilis on Wednesday, leaving at least two dead and 11 injured, the local governor said. 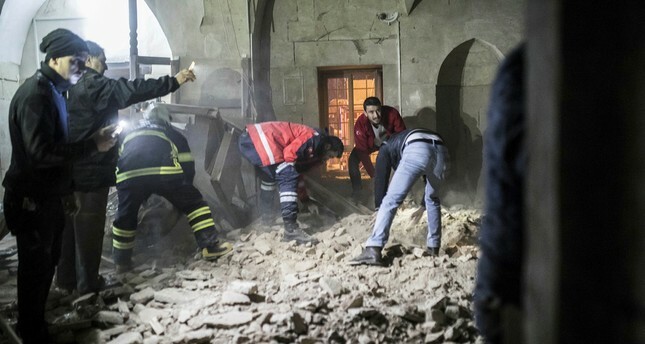 "The rocket fired from Syria hit the 17th century Çalık Mosque during prayers. Some of the victims have life-threatening injuries," the Province Governor Mehmet Tekinarslan said. He added a second rocket hit within 100 meters (300 feet) of the first. The mosque which was hit by the terrorists is located approximately six kilometers far from the Syrian border. Turkish media footage showed security forces clearing the areas of civilians following the attacks, as ambulances and emergency teams arrived at the site. As Turkey's operation against PKK's Syrian offshoot People's Protection Units (YPG) in Afrin entered its fifth day, at least 20 rockets have hit Kilis and border town of Reyhanlı in neighboring Hatay province. On Sunday, one Syrian national was killed and more than 50 other civilians were injured in Reyhanlı as anti-terror Operation Olive Branch entered its second day. While constantly claiming that Turkish jets and shelling cause damage in civilian areas in Afrin without proof, YPG terrorists across the border have indiscriminately targeted civilian areas. Turkish military destroyed two targets of the terrorist PKK's Syrian affiliate the People's Protection Units (YPG), from which the rockets originated, according to military sources. Turkish Armed Forces and Free Syrian Army on Saturday launched the Operation Olive Branch targeting the PKK terror group's Syrian offshoots the Democratic Union Party (PYD) and YPG in northern Syria's Afrin.